When I think of fertiliser, I picture things such as well rotted manure, blood & bone, chicken manure, seaweed emulsion – the list goes on. I never thought there was anything called Compost Tea. The name itself it quite off-putting. But when you think about it, plants need a drink too – they probably get bored of water (like us), so why not give them a serve of freshly brewed compost tea? Makes sense right? This is what it looks like and I will explain more below if you are confused in any way. What you see above is a small serve of Compost Tea, happily bubbling away and fermenting. I only just became acquainted with this type of fertilising a few weeks ago when I was googling on how to grow healthy, large organic vegetables for the home garden. Apparently this is something many people do – and many people can’t be wrong, right? Especially this guy. John Evans has been a Guinness Book of Records holder – 9 times! 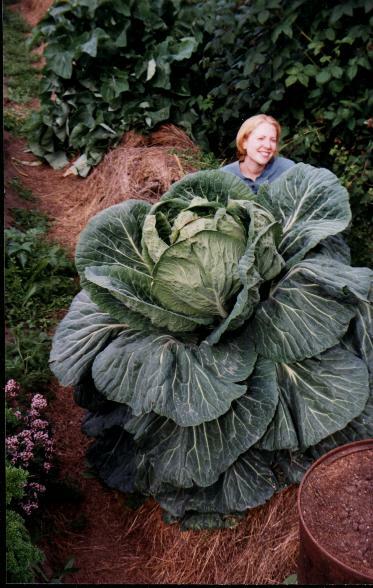 Look at his Cabbage. What do you need for Compost Tea you ask? I don’t want to mislead anyone because I am still new to this but part of the theory behind compost tea is the propagation of aerobic bacteria as opposed to anaerobic bacteria by providing them an oxygen rich environment in order for this to occur. The good bacteria and micro organisms from the compost, emulsion, micro nutrients etc are leeched into the water and with the help of the air pump supplying ample oxygen and the addition of simple sugars such as molasses – help the bacteria and micro organisms to multiply. In other words – you are really getting a bang for your buck. You are creating a nutrient rich liquid that would otherwise (theoretically) require tons of compost to have the same effect. As an avid gardener on a quest to grow a bumper crop of home grown fruits and vegetables – this method seems so appealing. What I will do from here on is to use the Compost Tea on a control area of vegetables and compare it to another to see if there is any difference. This will be done on a future post. Hopefully by then I will be able to provide something more succinct on this very promising fertilising method.